Silos and Hoppers are large air-tight containers that store, generate and process bulk material. Used in a variety of industries around the world, they hold products such as grain, coal, cement, carbon black, wood pellets, food and sawdust. There are three main types used on sites today - tower silos, bunker silos and bag silos. For effective production, the material inside an upright cylindrical silo should be able to slide along the inner walls without any obstruction. However, when the material inside the container builds up, the flow is either restricted or is stopped completely. Unblocking the silo and hopper correctly is necessary to avoid lasting damage to the structures. This is where Primasonics’ Acoustic Cleaners come in. Our devices are specifically engineered to clean the inside of Silos and Hoppers in a safe and effective manner. In doing so, our aim is to use the latest cleaning technologies to ensure the utmost efficiency of silos and hoppers, resulting in less bulk material flow problems in the future. We can even supply a research report that has been prepared jointly with the University of Liverpool, one of the UK's leading acoustic academic institutions, to prove that our Acoustic Cleaning Systems are completely safe. Different designs of silos and hoppers exist in order to meet specific market requirements. Some designs are created to process large abrasive material and others to process smaller soft material. The main industries that use silos and hoppers can be seen in the sidebar to the right. 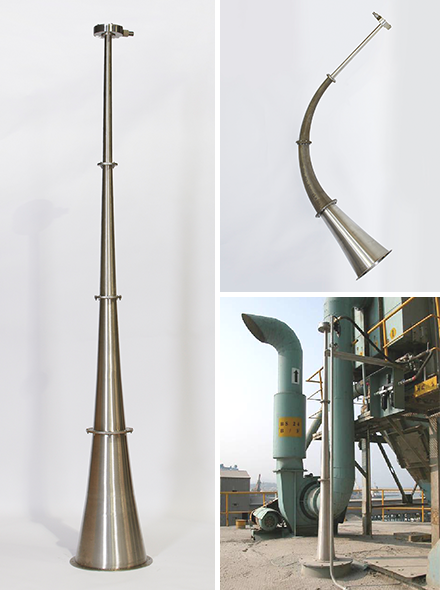 In these industries, the Acoustic Cleaner is mounted onto the top of the silo. Another device can be mounted at the discharge end if necessary to ensure continuous, maximum material flow. Silo and hopper issues can affect production across a range of industries. Metal is a strong, useful material. Yet certain factors can alter its properties and make it more brittle. Cracks in the vessel walls can start to appear if necessary maintenance work is not undertaken. Silo flow problems can eventually lead to structural damage and even collapse if not dealt with carefully. Therefore, thinking ahead to prevent problems in silos is essential. Friction on the inner walls of the silo can restrict particles from flowing freely. This is when blockages and erratic flow in silos starts occurring. The friction causes the particles to pile onto each other instead of sliding off the inner walls. Silo cleaning using Acoustic Cleaners eliminates both material bridging and ratholing to ensure that the entire capacity of the structure can be utilised. Our Acoustic Cleaners and Sonic Soot blowers provide the most efficient and cost effective means of preventing the buildup of particles. Employing the services of Primasonics Acoustic Cleaners can improve silo flow in the short and long term. But how exactly does an Acoustic Cleaner relieve blockage in Silo and Hoppers? It’s quite simple really. Sound waves are transmitted into the particulate matter or bonded material causing the solid particles to resonate and dislodge from the inner walls. Once dislodged, the silo buildup will then fall away due to gravity. The Acoustic Cleaner is activated by a timer and powered by compressed nitrogen (to avoid oxygen contaminating the product) to create the correct sound frequency. The timer is set to sound the Acoustic Cleaner for a few seconds at periodic intervals during either filling or discharging from the silo. The results are immediate, saving on both downtime and product loss. Silos are large chambers used for the storage of bulk materials. Health and Safety: Using a modern, remote cleaning system means that we avert the dangers posed by other traditional methods - such as a technician entering the silo. This method introduces significant risk from falling material and from the possible presence of gases. Our modern and cutting-edge equipment means that our services are efficient and safe. Convenience: The cleaning service does not require down time on site and can operate during normal working hours. Primasonics Acoustic Cleaners are placed on top of the silo and do not require the structure’s content to be emptied, as with other cleaning methods. Prevention: Acoustic Cleaners are designed to take a holistic approach when operating, in order to decrease the risk of future silo blockages. Even though a targeted area of the silo might need more attention, the cleaning service will also ensure that any other compacted material will be dislodged before further issues arises. Non-invasive: Unlike explosive cleaning methods and vibrators, there is much less danger of causing irreplaceable damage to a silo and hopper by using Acoustic Cleaners. They are designed to reflect sound waves from solid surfaces, therefore no damage or wear from intense vibrations will be caused.